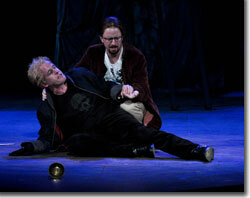 As the popularity of the most famous play ever written attests, Hamlet is indeed a man for all seasons. In director Philip Sneed's current production, running at the Colorado Shakespeare Festival, this universality is apparent in the eclectic costumes and abstract setting. Even if such an approach is dictated by economic considerations, it works in this case, though it serves more as an enticement to the young—Stephen Weitz's Hamlet includes some punk elements—than as an illumination of any subtext. 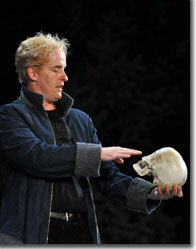 The role of Hamlet is, of course, central to the play's success, and Weitz is brilliant, plain and simple. The catalyst for his performance is the director's perspective on the brooding Dane, and Sneed wisely interprets Hamlet as a grieving but incredibly gifted young man. This paves the way for Weitz to open the fourth wall to a mind that history has placed, with few peers, at the top of world literature. Weitz seizes the opportunity with elegant scansion, unambiguous physical choices, both in consonance with and in counterpoint to the script, and a passion equal to Hamlet's noble stature and sentiments. 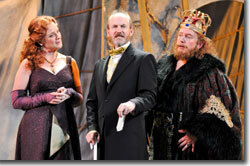 The play opens with the appearance of the ghost of Hamlet's father, which Hamlet observes in the company of his friend Horatio (Timothy Orr) and a couple of sentries, who see it as well. Though the ghost encourages Hamlet to seek revenge, Hamlet does not commit to a course of action until he has assured himself of his step-father Claudius' (Dennis Elkins) guilt by catching the conscious of the king in a theatrical "mousetrap," the famous play-within-the-play. Hamlet's seeming madness—e.g., when he calls Polonius a fishmonger, he is, as his original audience would know, referring to the character's prototype, Lord Burghley, and his encouragement of the fish industry by declaring Wednesdays, in addition to Fridays, meatless—is simply a ruse that distracts those who would do him harm or interfere with his plans, while gaining time to strategize. The curtains that figure in two key scenes are inconveniently located—we never see Claudius and Polonius hide to overhear Hamlet and Ophelia, so when Polonius drops his keys, it is unclear who has done this or whether it was a mistake; and when Polonius hides to overhear Hamlet and Gertrude, he does so around a corner from everyone sitting stage left—so the effect that the repeated curtain rustlings have on Hamlet's edgy psyche is mostly lost on the audience. The gap between Ophelia's behavior in the "play-within-a-play" scene and her "madness" scene is too great—she isn't crazy, she's mad with grief (as the King grants, just as the Queen did with Hamlet). This should build toward a suicidal depression that peaks in her scene with her brother Laertes. Granted, her father has died before she appears with Gertrude and Claudius, but some arc is needed to make her downward spiral more believable. The depiction of Polonius is too one-dimensional—he is, metaphorically speaking, William Cecil, Lord Burghley, the Lord Treasurer of England. In the early versions of the play, he was called Corambis (two-hearted), a Latin play on Burghley's motto, Cor unum ("One heart"). De Vere had a love-hate relationship with Burghley, who was his guardian and later his father-in-law. Burghley played a positive role in de Vere's education and occasionally argued for him at court, but played a duplicitous role in de Vere's finances and an overbearing role in his daughter's (Anne Cecil [Ophelia]) life. We need to see more of the manipulator when Polonius channels Burghley's precepts ("Neither a borrower nor a lender be," "To thine own self be true," et al.) to Laertes, as well as when he manipulates Ophelia's behavior toward Hamlet. Burghley was a spymaster, after all. Laertes carries a gun in his return to court. This may be consistent with the modern costuming undertones, but seems anachronistic when followed by a sword duel (the poison tip is a detail which does not appear in any Hamlet source material, but rather is borrowed from Beowolf, the only English copy of which was in Burghley's library when de Vere was in residence). Dennis Elkins, as Claudius, draws a multi-faceted and cleverly duplicitous king who, for a time, is able to hide his motives from everyone but Hamlet. Tammy Meneghini's Gertrude is an intelligent, loving mother who, in the absence of suspicion and proof, is unable to understand her son's point-of-view. Together, they provide constant motivation for young Hamlet's isolation, frustration, and ire. Overall, this bedrock along with Weitz's heroic performance and Sneed's faithful interpretation outweigh the distractions, making for a wholly satisfying dramatic experience infused with transcendent poetry. The Colorado Shakespeare Festival's Hamlet runs in repertory with Two Gentlemen of Verona, Much Ado About Nothing, and To Kill A Mockingbird through August 9th on the University of Colorado–Boulder campus. 303-492-0554 or at www.coloradoshakes.org. 1 It's worth noting that one of the Stratfordian arguments to account for the legal expertise included in the playwright's breadth of subject mastery is that Will Shakspere was involved in a court case or two, from which he ingeniously extrapolated a sophisticated vocabulary and insight into English law, thus explaining the various succinct legal references throughout the canon. Oxfordians point out that Edward de Vere studied law at Gray's Inn, one of the foremost law schools in England at the time, AND that legal cases discussed in the canon involved de Vere directly or were cases that he studied. In this instance (the gravediggers' repartee in Hamlet), de Vere would have been familiar with Hales v. Petit, a convoluted case involving suicide, which he uses to comment on Ophelia's death. De Vere was involved in a similar incident himself, when he accidentally killed a servant of William Cecil during a fencing session and escaped a potential murder charge by having the victim's death declared a suicide, to the consternation of the deceased's family. Once more, in regard to authorship questions, we are confronted with speculation (Stratford's Will Shakspere and his "genius" quality that fills in all the massive blanks in his biography) versus evidence (Oxford's pseudonymous "William Shake-speare) of the autobiographical events that fill the canon. On a side note, de Vere also viewed some theatre while studying at Gray's Inn, most importantly The Supposes, a subplot to which serves as the main plot in The Taming of the Shrew.